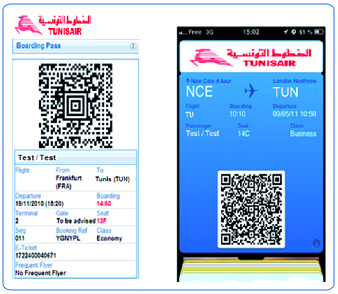 Tunisair online check-in service is free, fast and easy. This service enables you to check-in and choose your seat online before arriving at the airport and it is available 24 hours to 3 hours before each flight. 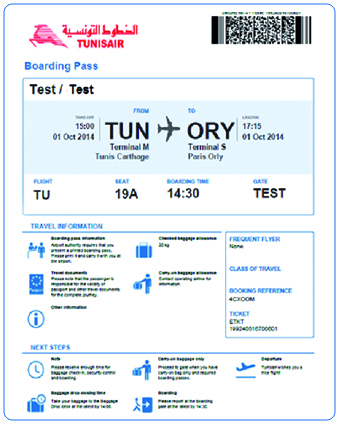 To access the online check-in service via Tunisair website www.tunisair.com, click on the “online check-in” button. When you reach the passenger identification step, you can either choose to go on via the web and click on the “web check-in” button or via your mobile phone and click on the “mobile check-in” button. You will receive your boarding pass by email and you can save it on your mobile phone and/or print it. The online check-in is available 24 hours to 3 hours before your flight's departure. Passengers with e-tickets can check-in online unless they are unaccompanied minor (UM), passengers with reduced mobility (PRM) or travelling with an animal. Passengers with hand luggage only proceed directly to the boarding gate in all airports but Tunisian airports. Passengers departing from Tunisian airports must proceed to the « Web & Mobile Check-in » counters to drop-off their luggage and receive their boarding pass. All passengers travelling with hold baggage have to proceed to the « Web & Mobile Check-in » counters before check-in counters closing time (60 minutes before the flight's departure). Cancelling online is allowed within 3 hours before the flight's scheduled departure time. *N.B: Passengers will be charged the Internet connection fees. Name and Fidelys card number. Select your flight and the passengers you want to check-in. Choose your seat (select on the seat map the seat where you would like to sit on the aircraft). In case you are a Fidelys member, enter your Fidelys card number to confirm the check-in. Press the « Confirm Check-in » button. Print your boarding pass and/or save it on your mobile phone. Either you travel with or without baggage; you are invited to proceed to the « Web & Mobile Check-in » counters in order to get your boarding pass. You can as well proceed to the check-in counter corresponding to your flight. If you travel with baggage, you are invited to proceed to the « Web & Mobile Check-in » counters in order to drop-off your baggage before the check-in closing time. If you travel without any baggage, you proceed directly to the boarding gate before the boarding time limit mentioned on your boarding pass (already printed or saved on your mobile phone).